“We always thank God, the Father of our Lord Jesus Christ, when we pray for you, since we heard of your faith in Christ Jesus and of the love that you have for all the saints” (Col. 1:3–4). Affirming Paul’s authorship of Colossians does not necessarily mean he sat down with pen and parchment to write the letter. That is certainly possible, but in the ancient world people often enlisted the help of an amanuensis to write letters. An amanuensis was much like a modern-day secretary. Sometimes he received an epistle’s content via dictation and wrote out the letters and words. At other times, the author would discuss the outline of the letter with the amanuensis, leaving the scribe free to craft the words. The author then read the letter before sending it, making sure it accurately reflected his thoughts. 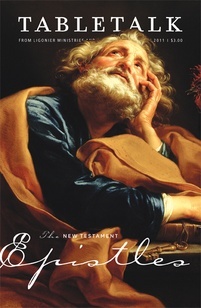 It may be that Paul used Timothy as an amanuensis to pen Colossians, for he is listed as its co-sender (Col. 1:1–2). If so, then God the Holy Spirit used the talents and experiences of both these men when He inspired the epistle. Though it received many visitors, being located along a busy trading route in central Asia Minor (modern-day Turkey), Colossae was not a very important city in the firstcentury Roman Empire. Paul himself did not preach the gospel in Colossae or plant the church there, but as an apostle, he was duty-bound to instruct a church in need. The body of his letter to the Colossians begins with his thanksgiving to God for their faith and love (vv. 3–4). It would be easy to read through these verses quickly without a second thought, but doing so would cause us to miss a profound theological lesson: Paul does not thank the Colossians for working up faith and love within themselves; rather, he thanks God that they have these graces. This indicates that faith and love are gifts from the Lord. Our Creator must grant faith, which reveals itself as it works through love (Gal. 5:6), to human beings if they are to be saved. Clearly, this gift is not given indiscriminately to all people (Eph. 2:8), and knowing this must drive those of us who love Christ to thank God for His sovereign grace. Hope is the ground of faith and love, the source from which they spring and are sustained by the Spirit’s power (Col. 1:5a). Such hope is not a wish for something that may or may not happen, but the present expectation of what will surely be experienced in its fullness in the future. Knowing that we will experience the fullness of salvation in the age to come, our faith and love are sustained in the present era. The apostles often refer to Christian hope in the New Testament, and it is easy for us to read our modern understanding of the term into Scripture, believing that Christian hope lacks certainty. But our hope as Christians does not refer to something that may or may not be; rather, it is grounded in real events that will surely come to pass. Hoping in God means simply that we have a sure expectation of Him to be true to His Word.